Allentown, PA - ATAS International, a manufacturer of commercial and residential metal roof, wall, and ceiling systems with production facilities in Pennsylvania, Arizona and Tennessee, has installed a Precision Servo-Feed Cut-to-Length Line in its flagship facility in Allentown, PA. The new Cut-to-Length Line, manufactured by Braner/Loopco, Schiller Park, IL, converts 15-ton x 60" wide surface-critical aluminum, copper, galvanized steel, and pre-painted steel & aluminum coils in gauges from .015" through .075" into precise length panel flat sheets. 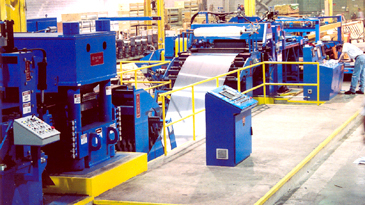 Equipped with a Computer Controlled Hydraulic Leveler and a Precision AC Servo-Feed, the line generates sheets at production rates to 60-PPM. 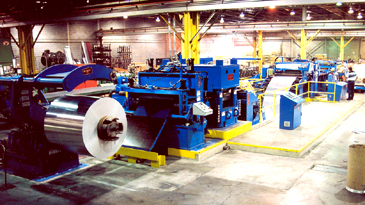 The new Cut-to-Length Line joins a Braner/Loopco 61" Single-Loop Turret Head™ Slitting Line in the ATAS plant. Precision Hydraulic Leveler-Servo-Feed Steel & Aluminum CTL Line. Entry Section: The CTL Line Entry Section employs a Telescoping Blade Peeler, Non-Marking Pinch Rolls, Non-Contact Hydraulic Servo Edge Guide, and a Hydraulic Crop Shear to prepare and quickly thread surface-critical strip into the Leveler. A sheared scrap cart collects the cropped coil head ends for quick and easy disposal. Cut-to-Length Line Entry Prep Section. Precision Shape-correction Hydraulic Leveler: A massive 4-post 1.500" x 17-roll x 7-flight x 5-Hi Roller Leveler produces panel flat shape corrected surface-critical sheets for ATAS. Leveler work roll and back-up adjustments are accomplished by microprocessor controlled hydraulic cylinders rather than the old motor, gear reducer, sliding wedge, and jack screw Leveler adjustment method. Hydraulic cylinders installed at the entry and exit ends of each back-up flight accomplish entry-exit work roll gap and side-to-side shape correction roll bend adjustments. Precision electronic linear transducers are employed to independently position each of the 14-hydraulic cylinders. Adjusting the entry end and exit end cylinder elevations causes the work rolls to be "tilted" front-to-back for coil-set correction. Adjusting back-up flight cylinder elevations from side-to-side across the Leveler roll face accomplishes "roll-bend". Precise "roll bend" is necessary for edge-wave and center-buckle shape correction. Hydraulic Leveler benefits include elimination of mechanical screw-wedge backlash, the ability to precisely repeat roll position settings, automatic set-up, automatic Leveler calibration in 5-minutes with no tools, and excellent reliability. Precision Microprocessor Controlled Hydraulic Leveler. 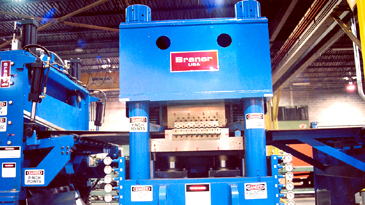 Computer Leveler Controls: 14-independently adjustable hydraulic cylinders position the ATAS Leveler for strip shape correction. Because there are so many possible back-up and work roll position adjustments, a computer is employed for Leveler set-up. 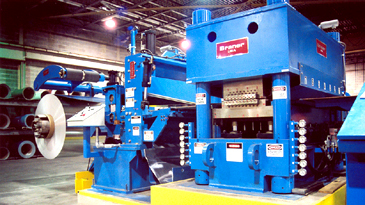 The operator enters the material yield strength and strip thickness, while the computer calculates the proper entry and exit work roll gap dimensions and sends position commands to the cylinders. Precision linear electronic transducers communicate position data to the computer as the Leveler automatically sets itself up. Hydraulic Leveler Producing Shape Corrected Strip. Side view of the ATAS CTL Line. Coil mechanical properties are entered into the "touch-screen" computer terminal console (center). 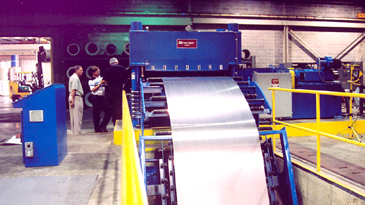 A Laminator applies protective PVC film ahead of the Shear.